Committed spiritual leadership possessing a deep, well-rounded knowledge of fundamental Jewish sources is the first and foremost requirement for sustainable Jewish-Israeli growth. The Beit Midrash for Israeli Rabbis is the only one of its kind, an egalitarian program training pluralistic Israeli spiritual community leaders to catalyze a process of spiritual rejuvenation for the Israeli public sphere and its emerging Jewish communities. The Beit Midrash, developed in partnership with HaMidrasha at Oranim, brings together voices representing the diversity of Israeli-Jewish experience to define an Israeli rabbinical leadership model for our times. The program creates a cadre of community spiritual leaders versed in a pluralistic Jewish language, with the drive, vision, and know-how to establish and lead spiritual communities within Israeli society. Based on a vision of Jewish peoplehood, the program emphasizes the development of a common values-based language for Jewish society in Israel. Program participants will learn and develop a new, meta-denominational language of Jewish identity that draws from Israel's diverse and rich culture and heritage. They will also gain the pastoral skills to effectively guide their communities in the contemporary world. The program's curriculum addresses some of the most compelling topics for Israeli society, including contemporary challenges, community and community support, sacred time (Shabbat, holidays, and lifecycle ceremonies), God and theology, family, mitzvah, halakhah, and law, and personal, community, and national morals. 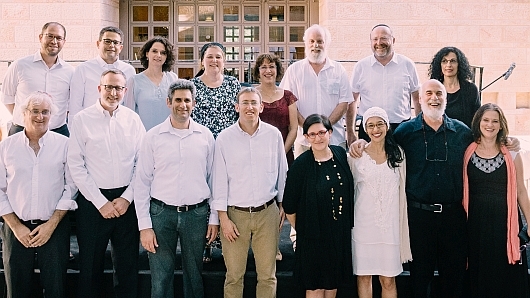 The pilot cohort was composed of 18 senior Israeli spiritual leaders, many of whom are already leading pluralist Jewish communities or programs in Israel. Future cohorts will comprise candidates with a significant background in Jewish studies who will undergo scholarly and conceptual development and training focused on creating a common vision and building community leadership capacity. Upon completion of the 18-month program in September 2016, participants in the founding cohort were ordained as Israeli Community Rabbis. A second cohort of 15 spiritual leaders will be ordained in September 2018. The ordination of the first group of Israeli rabbis occurred on September 20, 2016. Before the ordinations, eJewishPhilanthropy featured the Beit Midrash for New Israeli Rabbis in a July 2016 article titled, "Israeli Rabbinic Beit Midrash visualizes a more open, pluralistic Rabbinate in Israel’s future." Program directors are Dr. Biti Roi and Dr. Shraga Bar-on from Shalom Hartman Institute, Rabbi Tamar Elad-Appelbaum and Shay Zarchi from HaMidrasha at Oranim, and Rabbi Dani Segal, community rabbi of Alon and a founding member of the Ein Prat Academy for Leadership. HaMidrasha at Oranim is an educational center whose goal is to help shape a society whose members feel at home in their Judaism and weave it into their individual and collective identity; a society that promotes a sense of shared destiny and mutual responsibility and that cultivates dedication to social responsibility. To realize this vision, HaMidrasha works to improve and enrich Jewish education in the school system, foster Jewish-Israeli community life, develop social-cultural leadership committed to this vision, and pursue the prophetic tradition of tikkun olam and justice. Jewish Federation of Cincinnati, and other generous donors.